Economists generally agree that the Federal Reserve’s monetary policy decisions should be free from political influence. That said, studying the political independence of the Fed can be difficult, as there is no clear consensus on the definition of central bank independence. One way to measure it, as proposed by St. Louis Fed economist Fernando Martin, is to count the number of official in-person and phone meetings between the Fed Chair and the U.S. President, many of which can be found in the Calendars of Federal Reserve Chairs on FRASER. The number of such meetings serves as a proxy for Fed independence—the more meetings that take place, the less politically independent the Fed is (and vice versa). To construct this measure, which appeared in a recent Federal Reserve Bank of St. Louis Regional Economist article, we started by downloading PDFs of the calendars from FRASER. In most cases, the calendars were text-searchable, so we were able to build our dataset by searching for keywords such as “President,” “Pres.,” “White House,” “POTUS,” and the President’s name. When the text was not searchable or a Chair’s appointment calendars were not available on FRASER, we used the Presidential appointment calendars available from other sources to fill in the gaps. For example, the calendars of Chairman Arthur Burns (in office from 1970 to 1978) are not available on FRASER, so we searched calendars from the Nixon, Ford, and Carter presidential libraries and used a similar process to count meetings. Likewise, the calendars of Chair Janet Yellen are not available on FRASER, so we searched through President Barack Obama’s daily schedules. Unlike other presidents, his daily schedules are embedded in numerous webpages rather than being available as PDFs, so they are difficult to search through. To resolve this problem efficiently, we wrote a program in R  that performs word searches through the source code of every webpage that records President Obama’s daily agenda. Once the program identified all instances of “Janet,” “Yellen,” and “Federal Reserve Chair” in the President’s daily schedules, we manually double-checked the date and the nature of each event to ensure that it was indeed an official meeting between the Chair and the President. One application of our dataset is to use it to analyze the relationship between Fed independence and inflation, as some economists propose that well-intended central bankers may exhibit an inflationary bias if they are pressured by political forces. The figure below suggests a positive correlation between the number of meetings between the Chair and President and the personal consumption expenditures (PCE) inflation rate from 1952 to 2016. The relationship appears especially prominent from 1961 to 1976, when meetings became more frequent while inflation rose to undesirably high levels. Over the past several years, inflation has perhaps been too low, running consistently below the Fed’s 2 percent inflation target. The Regional Economist article suggests that the clear downward trend in the number of meetings between the Fed Chair and the U.S. President reflects increased central bank independence, which may have contributed to persistently low inflation. However, the authors argue that greater central bank independence is not as pivotal as some other factors in creating low inflation, such as the effects of recent changes in technology and demographics. 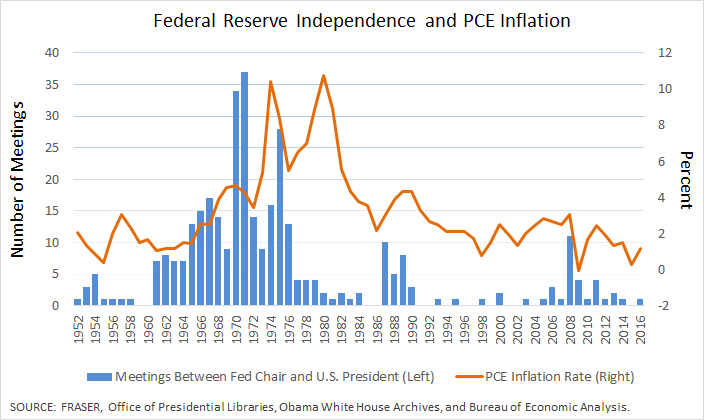 Still, Fed independence remains a key variable that affects inflation and other aspects of the economy. While Fed independence can be difficult to study, resources from FRASER provide insight into one measure of independence—the number of meetings between the Fed Chair and the U.S. President. See Fernando M. Martin. “Debt, Inflation, and Central Bank Independence.” European Economic Review, October 2015, 79, 129-150. Here are links to presidential calendar books: Truman, Eisenhower, Kennedy, Johnson, Nixon, Ford, Carter, Reagan, Clinton, W. Bush, and Obama. Calendar books for George H.W. Bush are not available online and were not used in our analysis. See Christopher J. Waller. “Independence + Accountability: Why the Fed Is a Well-Designed Central Bank.” Federal Reserve Bank of St. Louis Review, September/October 2011, 93(5), pp. 293-301. See Hee Sung Kim and Juan M. Sánchez. “Why Is Inflation So Low?” The Regional Economist, First Quarter 2018.